Tea fungus appeared in Russia in the early twentieth century and became widespread in the 80-ies. In our time, it undeservedly forgotten and quite rare, despite the fact that a drink made with it, has valuable therapeutic properties. 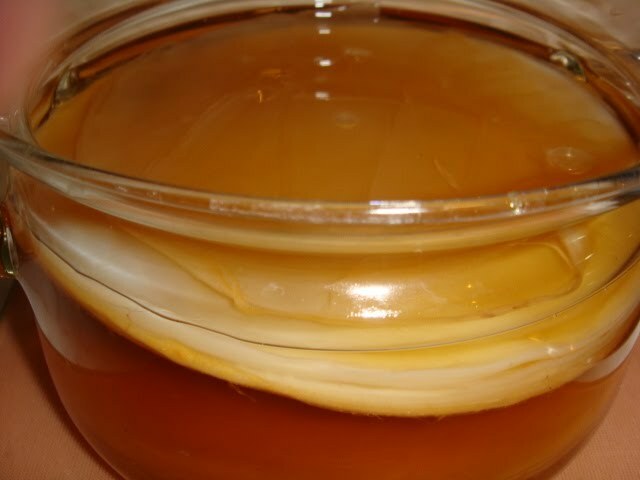 How to care for Kombucha. Tea mushroom is a strange kind of culture. The upper part of his thick and glossy and the bottom is similar to a cluster of dangling strands. In biological terms it is a symbiosis of yeast funguska and acetic acid bacteria.Most often for the maintenance of tea fungususe glass and 3-liter cans. In any case, do not use for this purpose metal utensils and containers made of polyvinyl chloride or polystyrene. Keep the jar with a tea mushroomOhm in a shaded place away from Windows, as direct sunlight and cold equally harmful for him. It is best to place the container with the mushroomω in a special box. Try to ensure that the ventilation of the box and lack of odor. Cover the container with a tissue or gauze to keep the dust and insects, but in any case do not close the jar lid. The fungus needs . Best tea mushroom feels at a temperature of approximately 25 degrees. The temperature is below 17 degrees harmful. To prepare the tea solution, use only pre-boiled and cooled water. You can't put the mushroom in water poorly soluble sugar or just fill it from the top. It causes burns on his body. Tea fungus need to be periodically cleaned, preferably in spring water. In the summer it has to go through 1 – 2, and winter 3 – 4 weeks. The fungus can become sick and die if the tea solution too long don't change. If the upper layer appeared tarnish, rinse well fungus, remove top layer and place in the fresh tea solution. What if you decided some time not to use a tea mushroom, but want to save it? Remove the part of the mushroom. Put a jar in the fridge. Frequently rinse the mushroom in cool water. At low temperatures, its activity is markedly reduced.